Making books with kids is a wonderful literacy activity. We've been lucky enough to get tips about it from Vanessa Levin, Susan Kapuskinski Gaylord, and I've brought you some suggestions of my own in Book Chook Ideas for Making Books with Kids. Today, as part of a blog tour to celebrate her book, Riley and the Curious Koala, Tania McCartney shares her inspiration and expertise on crafting a picture book with photographs. If a picture paints a thousand words, the addition of photographs adds yet another dimension to the powerful visual medium that is the Picture Book. A great picture book has the ability to gather up and plunge children deep within its pages – sometimes rendering text superfluous, but most oftentimes taking it to whole other levels of nuance and meaning. Such is the deliriously happy marriage of words and pictures. 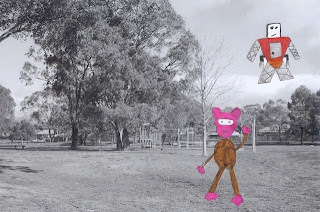 Being a fruitless artist and instead finding my craft in words and photography, creating my first children’s picture book using photos seemed natural for me. Coupled with a hopeless love of travel, Riley and the Sleeping Dragon: A journey around Beijing (the first in the Riley series) was born of my love of all these elements (and my tragically absent artist’s gene). And frankly, having to travel to take photos for my books – well, let’s just say my husband thinks I’m a mastermind in tax deduction. But creating a book using photos needn’t mean leaving home shores. As Writer in Residence for a Canberra School last year, one of the most incredible experiences of my writing life was producing a series of books with children aged 6 through 12 – in which the children were required to take their own photographs (around their school), write their own adventure modelled on Riley and the Sleeping Dragon, and construct their books into real life ‘published’ tomes. The use of photos in this way is not only a hands-on and highly creative way to observe the world around us, it’s a priceless way to create mementos of our life, woven slickly into a storyline – coupling the real with the unreal in a way that adds such depth and eye-popping cleverness kids absolutely adore. I’m often asked by children why I use black and white photos in my Riley books… and yet when I pose the question straight back to them, they inherently know why. The use of black and white not only lends a timeless and beautiful visual appeal, it allows the illustrations to shine and really pop from the detailed photographic images. Photographic detail is also easier to appreciate in black and white, and this monochromatic look paves the way for bright-coloured background pages, too. Designing and creating a photographic picture book at home or school is remarkably simple and so much fun. The first step is to choose a setting, then photograph that setting in a variety of angles, ensuring there is enough space to land aeroplanes or UFOs, sail ships to shore or ride horses at a gallop. Allowing children to think spatially like this is quite remarkable to watch. Once photos are taken, children can then think about a storyline that involves a simple formula – a setting, a main character, a problem (one involving a tangible item is often the easiest), and the journey to solve that problem. Having their main character need to find something or save someone is one of the easiest ways for kids to come to a resolution, especially younger children. Printing off (on A4 paper, preferably in B&W) and laying out photos to ‘storyboard’ the tale helps children think about their plot laterally. Once their story is fleshed out in this way, children can then start drawing their characters, vehicles and objects, which will be superimposed over the photos. The use of vivid colours is important, so illustrations will stand out brightly. The easiest way to keep the kids involved in the superimposing process is to physically cut drawings out then lay them on the photos. Photos can either be printed in A4 size (ie: taking up an entire page) or can be printed a little smaller and placed on an A4 sheet before drawings are layered on top. Printing photos smaller allows for the use of both portrait and landscape shots. I suggest adding the children’s illustrations with tiny pieces of blu-tac, to allow for moveability. Older children can scan their illustrations into a software package that allows them to cut out and place the images on their photos digitally. They can also overlap illustrations onto the background page and add extra hand-drawn elements to the photo, if desired. The most charming way to add text to pages is handwritten, though children can type, print and cut out strips of text to add to each page. The final step is to scan and then print each page on quality paper, then bind the book or slide it into a folder with clear plastic pages. During my Writer in Residence programme, the children also created their own front and back covers and verso pages, with cataloguing-in-publication data, dedications and copyright information, adding further dimension to the book. We even made barcodes with faux ISBN and had a mass book launch (yes, the real life media came!). Adventure stories are not the only way children can use photos to craft picture books. Kids can create amazing autobiographies by using photos, text and drawings, family trees, memory books or they can catalogue special events, friendships, school, travel – the possibilities are endless. From journaling to creating their own semi-virtual tale, crafting picture books with photos adds a multimedia element to the creative writing process children will adore. And the results will see parents and teachers standing back to regard their efforts with consummate pride. 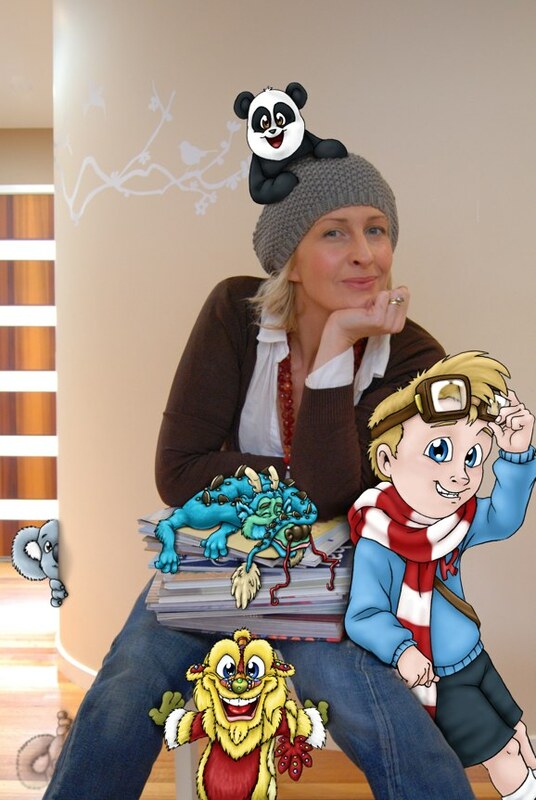 Tania McCartney is an author, editor, publisher, blogger, book reviewer and mango devourer who loves writing, celebrating and supporting children’s literature – and literacy. She is the author of the Riley series of travelogue picture books, as well as several published and self-published adult books. Tania is an experienced magazine writer and editor, is the founder of Kids Book Review and is a Senior Editor at Australian Women Online. She lives in Canberra with a husband, two kids and a mountain of books. See www.taniamccartney.com for more. 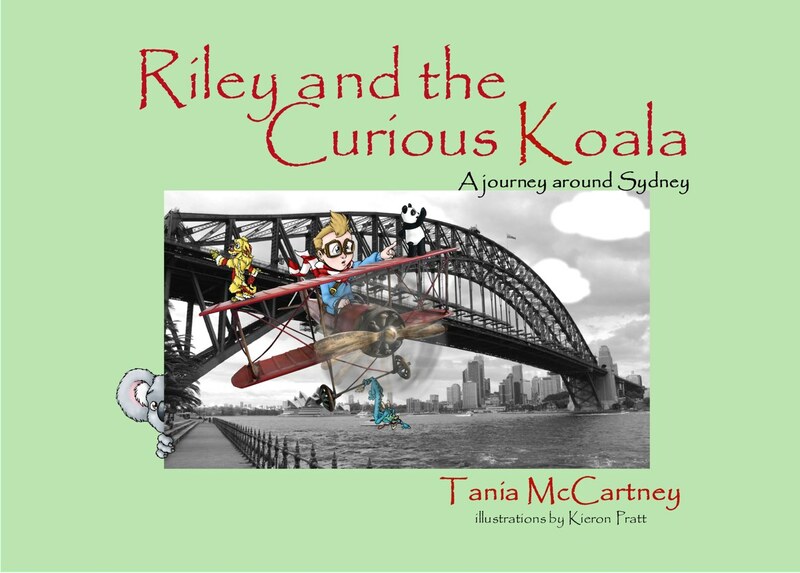 Riley and the Curious Koala is the third in the Riley travelogue series of picture books, taking young children on a journey to far flung destinations. Riley’s first adventure began in Beijing with Riley and the Sleeping Dragon, continued on through Hong Kong with Riley and the Dancing Lion, and now enters home turf, with a fun-filled adventure through the beautiful city of Sydney. Will Riley find this terribly elusive and quite curious fluffy creature amongst the gorgeous watery vistas of one of the world’s most beautiful cities? Panda, Dragon and Lion from earlier books join this little aviator on his sensational Sydney search… and their discovery is a curious (and funny!) one, indeed. Using stunning black and white photos, pictures of a real life tin aeroplane and hilarious illustrations by illustrator Kieron Pratt, Riley and the Curious Koala is perfect for experienced travellers, armchair travellers or for those wanting a fuzzy little adventure. Part of the profits for Riley and the Curious Koala will go to the Australian Koala Foundation. Thanks, Tania! Kids will love making a book this way, and all of the Riley series make great models for their own travel stories. Book Chook readers can join me tomorrow for my review of Riley and the Curious Koala. To follow Tania as she zooms around the blogosphere, catch her schedule on her blog. What a fantastic idea, Tania - a wonderful creative outlet for kids (and adults!). I LOVE the idea of mixing real life photographs and fictional characters. It captures the idea of bringing imagination to everyday life. I like. I like. I agree, Megan. I love doing making books myself. Doing it with kids just doubles the fun! You've got it, Kelly B! Tania's is a great idea for creative expression and encouraging kids to use their imaginations. I agree Kim. The achievability of this project makes it such a winner! You've nailed it Sheryl - reading and writing are so intertwined that way! What fun to peek behind the scenes and learn how to use photos to encourage writing. Simple and fun is a winning combination where kids are concerned! Great ideas. I will see if I can find some of the books here at my side of the world. Thanks for sharing. And a belated Happy Easter to you too! The fruit cakes being compared to bricks definitely makes my chuckle list…..perhaps some fruity garnish around the display would have added more relevance. It is quite strange how the human mind works, and association is key to avoid possible misyunderstandings like this one! Classic!